Sometimes, however, the client-agency partnership gets strained or falls apart. Why? Because the agency and the charity don’t understand each other. As in any floundering relationship, all manner of communication failures may be involved: one side misinterprets the other’s expectations; proposals don’t get proper feedback or review; individuals forget to be considerate, or just don’t hit it off. Charities are understandably outraged when agencies seem to under-perform or over-charge; conversely, they might be surprised how often agencies complain about unreasonable demands, lack of respect and even dodgy dealings from charity sector clients. It might be about an unclear brief, a punishingly short deadline, an unnecessarily exhausting and (for the agency) expensive pitch process — or about lovingly-created ideas being apparently rejected then pinched and produced on the cheap. Ask either party and both will say what’s needed is clarity, transparency and respect on both sides. But putting these things into practice is not always as straightforward as it sounds. Charity clients need to ask themselves some tough questions before even beginning the process of looking for an agency to meet their needs. Some organisational housekeeping may be necessary: Who are your decision-makers? How clear are your objectives? Do you have buy-in from the top? Do you even need an agency? And if you do, how will you go about finding and briefing one, and what kind of a client do you want to be? These are questions that can go to the heart of an organisation’s strategic or cultural outlook. CharityComms pulled together a steering group of charity and agency experts, gathered a wealth of advice, experience and viewpoints from both sectors and has now produced a best practice guide to help charities better choose and manage their relationships with external suppliers. 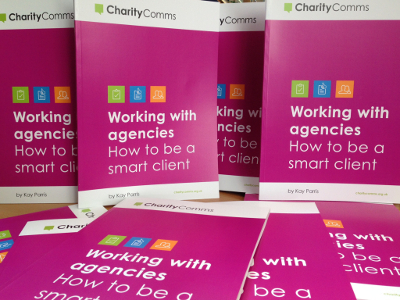 Download Working with agencies: How to be a smart client free or buy a printed copy for £5 inc p+p.